Residents on the island of Caye Caulker are normally pleasant and easygoing, but Amandala understands that the current dredging of sand from areas around the island has caused vast discontentment among island residents, leading to a fiery protest today on the island. The dredging of the sand has infuriated a number of the island residents, and has even resulted in a degree of upheaval as this morning, the villagers protested at the area where the dredged material was being trucked onto a waiting barge to be taken to the nearby island of San Pedro. Approximately 50 residents reportedly blocked the road which the truck drivers were using to convey the loads of sand to a waiting barge. One of the concerned Caye Caulker residents who spoke to Amandala said that they are downright mad because they were not given any notice that something like that would take place, and to make it worse, they cannot get answers from any of the authorities on the island as to why the sand, which is being dredged from their island, is being taken for use on another island when there are many broken streets on the island, which the sand could be used to improve. 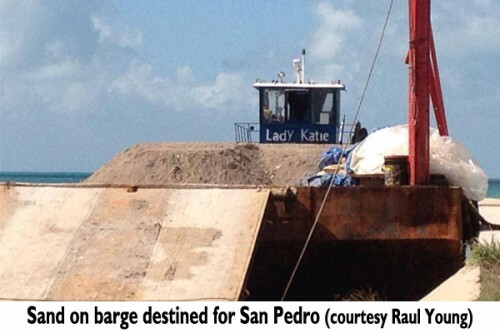 Apparently, the sand is being transported to San Pedro to be used on a proposed terminal walkway, and according to the resident, this is the second time that sand has been dredged from Caye Caulker and taken over to the larger neighbouring island, San Pedro. The village council chairman (who?) told angry residents that the sand was being mined under a previous legitimate contract between the then council and a businessman, and that one of every ten loads mined would be given to the village. The contract expires at the end of December, the villagers were told. The enraged villagers were far from appeased; they said that there are “many bad streets” in Caye Caulker that could be improved by the depositing of some of the material. The situation has reportedly been made worse by the trucks in which the sand is transferred. According to the residents, the two dump trucks which carry the loads of sand do not pay the customary fee to the island’s Transport Board; yet, they have significantly added to the damage of the streets on which they traverse. The resident said that they became worried after they brought up the issue with both the village chairman and the area representative, and neither have assisted with the situation or even paid any attention to their concerns. They are now truly frustrated, and one of the residents explained that they “don’t know where else to turn to” because “we need our sand”, she stated. They concurred that they would have at least wanted the privilege and/or opportunity to buy some of the sand; however, they lack the backing of the village chairman and the area representative, Hon. Manuel Heredia, who residents claim have done nothing for the island or its inhabitants since being elected. Some of the residents have posted on the Internet video footage of the sand being trucked through and from the island. Amandala has tried to get in contact with the area representative, Hon. Manuel Heredia, to get his side of the story; however, our calls have gone unanswered.